Here are 161 wise, witty, and spirited short pieces and essays by the inimitable E. B. White. 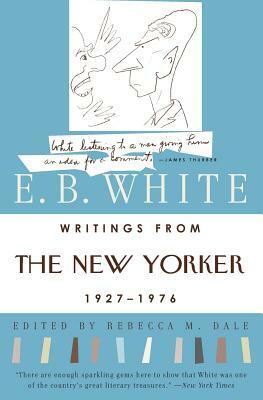 Written for the New Yorker over a span of forty-nine years, they show White’s changing concerns and development as a writer. In matchless style White writes about everything from cicadas to Khrushchev, from Thoreau to hyphens, from academic freedom to lipstick, from New York garbagemen to the sparrow, from Maine to the space age, from the Constitution to Harold Ross and even the common cold. White has been described by one critic as “our finest essayist,” and these short pieces and essays are classics to be read, savored, and read again. Also included are an Introduction and Selective Bibliography by Rebecca M. Dale.